THE METAL FALCONS #GIVE US WINGS TO FLY HIGHER….!!! SUPRA (Super Racing) is a National Level Engineering Student Competition where Teams from Various Engineering Colleges Participate. In this competition Students Design and Fabricate a Formula Style Vehicle. 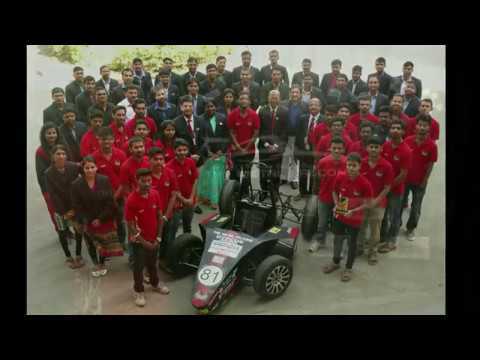 The students not only design the vehicle but also built them as per the given set of rules (Rule Book) and design standards of SAE International. Making the students learn and realize their talent through such an experience. Through this we try to extract the future Entrepreneurs, Technocrats, Innovators and Leaders, thus serving the prime objective of bringing out the real talent to serve the Indian Automotive Industry for the years to come. We are team 'The Metal Falcons' , a group of 35 undergraduate engineering students working under the SAEINDIA Collegiate Club representing ‘D.Y Patil College of Engineering, Akurdi, Pune’, participating in an National event called 'SUPRA SAEINDIA' a competition which gives the Under Graduate Engineering Students the task of designing, modeling and fabricating a formula type racing car. We self-design and manufacture 90% of components in our racing car with only exception of engine and rims. We being SAEINDIA members promote SUPRA SAEINDIA EVENT to transform our theoretical knowledge into reality. We also organize AUTOMOBILE WORKSHOPS in which we provide hands on experience to participants by dissembling the whole car as well as KTM 390 DUKE ENGINE. The Spearhead car of our journey which pioneered the racing adrenaline in our college. We got overall All India Rank 65th along with 3rd place in CAE Awards. Our team got All India Rank 9th among 150 teams and DRONACHARYA Award to our faculty advisor Prof. Sushant Pande sir for his excellent guidance. Achieving All India Rank 19th,the only team to self-designed CARBON FIBER bodywork which helped us making lightest of all our cars and we were among 25 teams to qualify in endurance out of 150 above teams on main track of BUDDHA INTERNATIONAL FORMULA ONE CIRCUIT, DELHI. The team bagged the Go-Kart CHAMPIONSHIP 2016 by conquering All India Rank 1st and also won the BEST ENGINEERING DESIGN AWARD. There are countless factors for a team to win the Competition but however the most important one is SUPPORT. Your encouragement will boost us with hope and courage to work harder and bring our ideas and innovations to design table. We can assure your assistance and help in the form of monetary help will not go vain and will lead us reach to podium at Buddha International circuit, Delhi in this upcoming season. HOW FUNDS WILL BE UTILIZED? Your share could be as good as a donation for vivek gawali! Not everyone can afford to take care of their loved ones. vivek gawali's life can only be saved by donations made by kind people like you.